Bel Air is located in Harford County, Maryland. Bel Air is located on US Route 1 and has a population of 10,120 according to the 2010 census. Bel Air’s summers are warm, humid, and wet, and the winters are cold and windy. Throughout the year, the temperature usually ranges from 26°F to 85°F and is rarely below 13°F or above 92°F. Incorporated in 1874, Bel Air originally went by the name “Scott’s Old Fields.” With the introduction of the canning industry, the Ma & Pa railroad, and other financial businesses, Bel Air began to grow into the town it is today. Currently, Bel Air includes one of Maryland’s 24 designated Arts and Entertainment districts. It is used for concerts, art galleries, other venues and events, and it is located in the city’s downtown area. The town is also the center for governmental, educational, cultural, medical, and commercial institutions in the county. 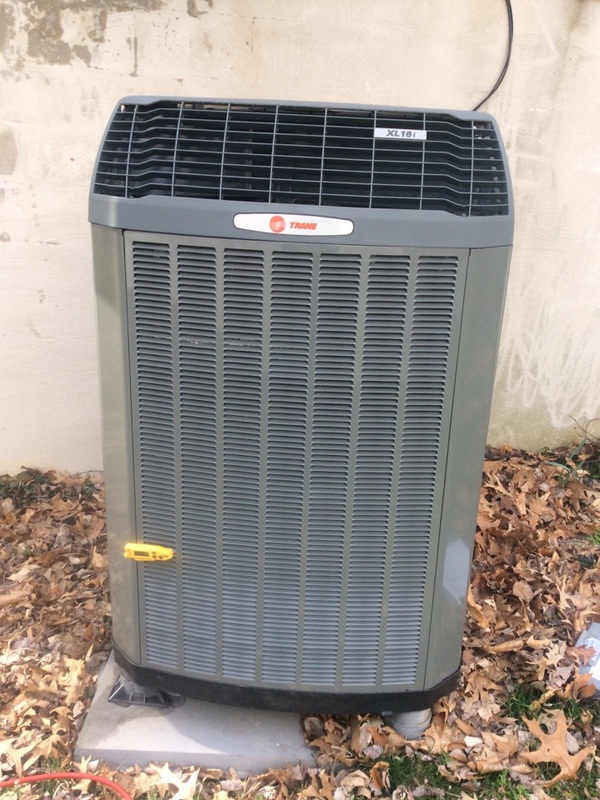 Supreme Air provides Air Conditioning, Heating and Plumbing Services, Repair, Installation, Maintenance, and Tune Up in Bel Air, MD and surrounding areas. Spring Pm On 04/23/19 the voltage absorption system was well I was recommended to the customer replaced compressor run capacitor customer approved after I finish the spring Pm I come back today with new capacitor 80UF on arrival turn off the unit replaced the capacitor I tested checked electrical connections checked voltage and amps checked all electrical connections start up and unit began operating very smoothly without any hesitating or lag measured supply and return air temp unit operating normal at this time. Collected $350.35 the credit card on file. 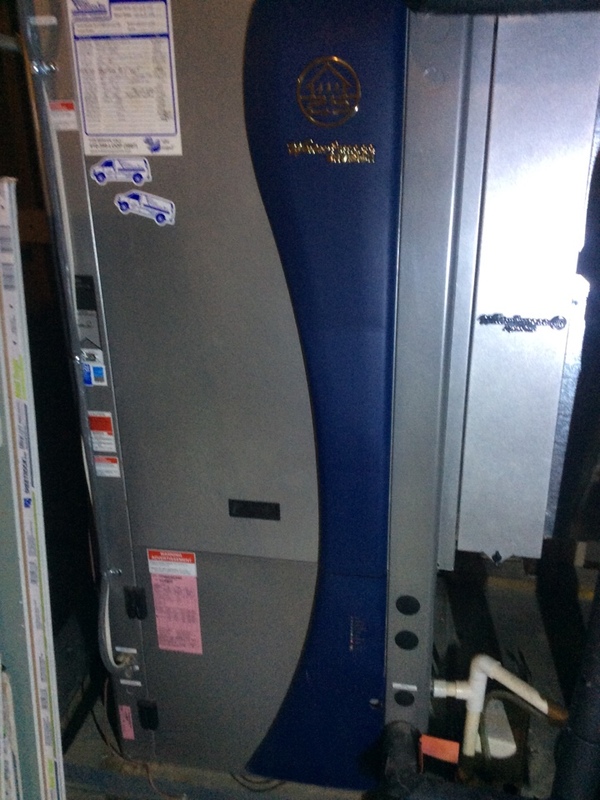 Spring Pm On 04/17/19 On arrival set unit to call for cooling measured supply and return air temp measured voltage and amps inspected electrical connections checked drain and cleaned checked filter and replaced checked water pressure it was low 0 psi I pump it back up 55/50 unit tested unit operating normal at this time. Also I have to come back Tuesday04/23/19 10 to 2 to replace the capacitor. On arrival set unit to call for heat and cool,measured voltage and amps inspected electrical connections checked drain and coils,heat exchanger ,flame safeties ,caps,unit operating normal at this time. Spring pm on 03/29/19 On arrival set unit to call for cooling measured supply and return air temp measured voltage and amps inspected electrical connections checked drain and cleaned checked filter and replaced also checked condenser unit outdoor checked electrical connections checked condenser coil In and out temp checked capacitor checked voltage and amps unit tested unit operating normal at this time. I found a lot of dust AHU cabinet Highly recommended Duct needs to be cleaned ASAP. On arrival checked thermostat was calling for cooling. 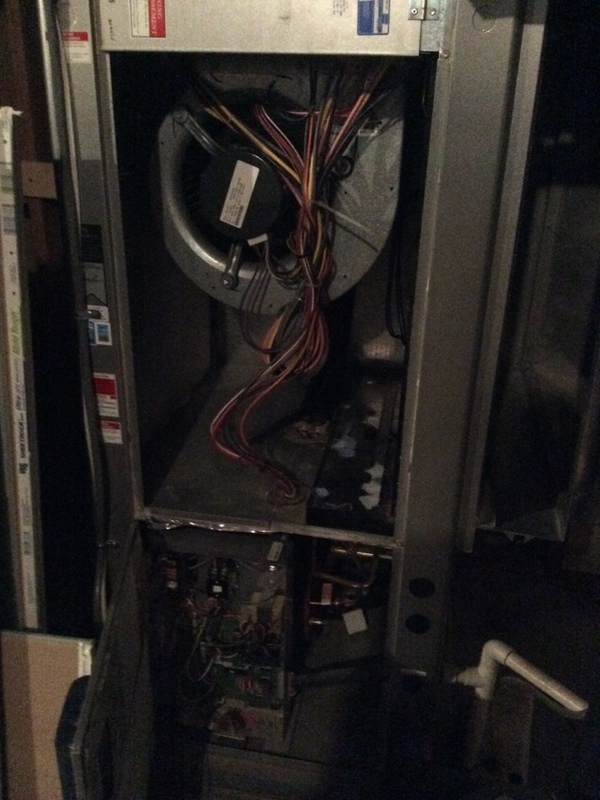 Checked temp coming in, temp going out, filter(clean),voltage, amps, contactor,cap, and electrical connections. I quoted customer for a single surge protector, customer stated that she will think about installing one. On arrival I visually inspected the entire units for defects,also replaced all filters .units are operating normal expect for unit 1 which needs contractors replaced. Costumer complained of HR office being too hot in the morning when they come in and cool in the afternoons . Thermostat was set for 70 and their office is at 70 degrees . Checked operations on unit and supply air 100 and return air 72 . Supply vent in office is putting out 98 degree air . HR closes their door when they leave for security reasons and there is no return vent in the office . I changed the thermostat schedule and dropped it down to 68 when everyone leaves the building and set for 72 at 8 am when the office opens . I did that to avoid their office getting overloaded with air at night with no where for it to go . I also recommend putting in a return in their office to better help with air flow while that door is shut . Upon arrival I found thermostat off. Turned heat back on and found heat running on roof. Lowered setpoint so only first stage would run and found thermostat settings had been changed to HeatPump, making system run in ac mode when calling for first stage heat. I didnâ€™t realize settings had been changed when previously here for repair. Put thermostat settings back to conventional and checked operation. Found unit now operating normal. Put setpoint back on schedule. Upon arrival I was told that unit 1 had leak, no refrigerant in system. Put gauges on and confirmed no charge. Opened up all doors and found hole in Evap coil pipe. Went to truck and brought torch, nitrogen, and brazen material to roof. Sealed hole with brazen then pressurized unit with nitrogen. Held pressure and tested for any other leaks. None found. Removed nitrogen and vacuumed system down. Added factory charge of 12lb 10oz of 410a. Restarted unit and checked heating operation. Normal pressures and temps. Tested defrost mode. Let system satisfy thermostat. Unit operating normal. 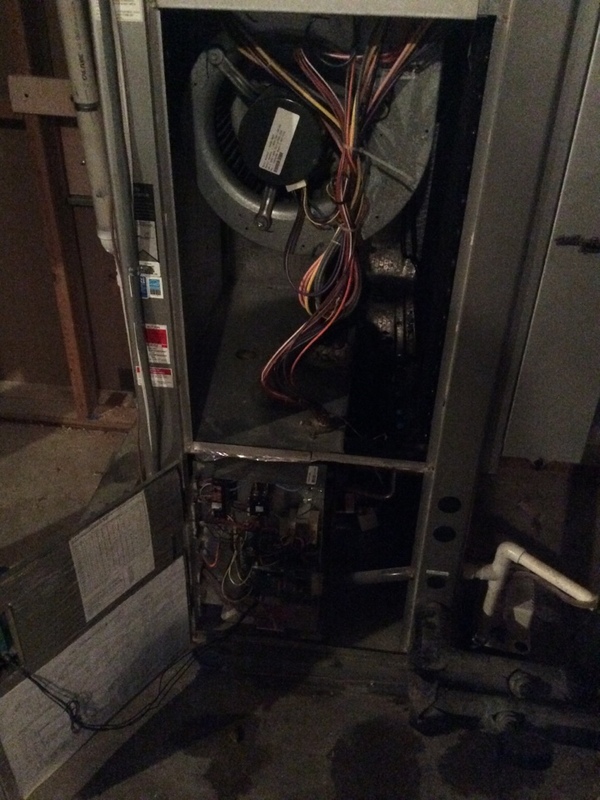 On arrival found unit not operating due to a pressure switch open, compressor was not coming on, there's not any freon. We need to come back and perform a leak check. On arrival checked unit and did not find any leaks. I believe that it has to do with the roof. They need to bring the roof person to fix it. Upon arrival I was told that front lobby had 2 leaks coming from roof. Roofers couldnâ€™t find anything and they speculate the hvac Units. During diagnostics I found leak was coming from both roof and hvac unit. Left side leak was caused from filter door not being installed properly. Found left screw not in and door flapping, letting in rain. Also found part of roof was peeling, poured water and found leak in roof. Right side leak is definitely not coming from hvac unit, leak spots arenâ€™t near unit. Found crack in beam at the top of interior portion of roof. Took pictures and uploading them to invoice. Fall pm on 01/04/19 On arrival set unit to call for heat measured supply and return air temp measured voltage and amps inspected electrical connections checked drain and cleaned checked filter and replaced unit operating normal at this time. Siliconed all around th unit , where the metal was bent upwards . If you are located near Bel Air, MD and you need assistance with your HVAC services, Supreme Air, LLC is your local community’s best provider! Our team is trained and qualified to help you with services, repair, installation, maintenance, and tune up at a moment’s notice! We have been servicing your community for years on end, and we offer the best and most affordable deals out there. Our team is certified and trained to deal with any emergency HVAC issues, and the best part is that they are available 24/7 for all emergencies! If you have an issue that requires immediate response, we will be there in the blink of an eye any time during the day or night. At Supreme Air, LLC, we understand the feeling of being stuck with a system that does not work and we know the urgency that comes with getting back on your feet. Our team not only services your equipment when you need it most, but we also offer services for all different makes and models, so you can be sure that we can fix your problem, whatever it happens to be. It’s no fun living with a broken system, so make sure to get your issues sorted out right away with Supreme Air, LLC! At Supreme Air, LLC, we offer the reliability and professionalism that you are looking for in an HVAC contractor. Our team is always on the move, helping customers or learning new skills to help future ones. We value continuous learning, and we make a point to take time out of our days to study and become familiar with the latest technologies and brands on the market. This way, we can better service our customers when they decide to give us a call. We are always brushing up on our air conditioning, heating, geothermal, and plumbing knowledge, and we are always prepared to deal with the unexpected. We don’t only have 24-hour availability in the case of emergency repairs, but we also are available 365 days a year for your convenience. You can bet that we will show up on time to our appointments, and we will be prepared with the right knowledge and tools to help you along with your problem. We know that around the clock availability isn’t enough to keep our customers satisfied – we also work hard to train our technicians to fix your systems in a timely manner so you are not left waiting hours on end for simple fixes to be performed. Our team will arrive at your location and be in and out before you know it! We have years of experience that have all amounted to the technical experts that we are today, and we are here to serve you when you need it most. We at Supreme Air, LLC are 100% dedicated to you and your satisfaction, and we will go above and beyond to keep you happy. Maintenance and tune ups can help keep your systems healthy as they fight against the passage of time. At Supreme Air, LLC, we can send a technician when you request an inspection to check on how everything is running. They will perform routine tests to determine the status of your equipment, fixing any small issues they find to keep your system in tip top shape. This will not only prevent these small issues from growing into larger ones, but it will also give you the peace of mind that your equipment was serviced by a licensed professional. Instead of relying on your own gut and knowledge of HVAC equipment, come to someone who has been in the business and has years of experience instead! Alternatively, we also offer maintenance plans, where we handle the entirety of the maintenance schedule. Rather than giving us a call when you want your equipment looked at, we at Supreme Air, LLC will take it upon ourselves to schedule all of the inspections and visits. This way, you can completely forget about caring for your HVAC equipment and leave it up to the expert technicians on our team. You can still call for maintenance if you want it, however, and as always, you can call for repairs. All maintenance plans do is give you the option to sit back and relax as we handle all of your concerns for you! If you are considering an upgrade or replacement for your current HVAC systems, Supreme Air, LLC can help you every step of the way. First, we can have our team evaluate your current equipment to help you determine if you actually need a replacement, or if you just need a few touch ups and repairs to stay functional. We will take many factors into account, such as the cost of repairs and the likelihood of future problems before giving you a recommendation that you can ultimately agree with or reject. If you do decide to go with a new system, our team of experts can walk you through all available options on the market that fit your requirements to help you choose one that fits your needs. Supreme Air, LLC has entered the game of energy efficient geothermal solutions for your convenience. These systems work off of energy stored in the ground, and provide a renewable source of energy that you can harness. It is an environmentally friendly solution that can keep your own needs satisfied while you care for our planet! Additionally, you can benefit from a federal tax credit if you choose to go the geothermal route. A 30% tax deduction on the cost of your installation and equipment can benefit you a lot, and Supreme Air, LLC can help you ensure that you are qualified to receive all benefits. If you have any questions about geothermal solutions or want to learn more about the offerings, get in touch with our experts today or visit our website! Supreme Air, LLC also offers plumbing assistance in Bel Air, MD. We believe that you shouldn’t have to go to different providers to get assistance with your home facilities, so we offer plumbing repairs, installations, and even replacements. Our team is experienced and ready to help you with whatever your needs may be! Think about the convenience of being able to call one phone number and talk to a representative you are familiar with for all of your HVAC needs in addition to your plumbing ones. Our teams are all highly trained in their specific fields as well, so you don’t have to worry about getting less value for the convenience that we offer. Our services are just as good if not better than companies who are only dedicated to plumbing matters! Similar to our HVAC emergency services, we take calls 24/7 for any plumbing emergencies as well. If you have anything wrong with your pipes or plumbing system, you can count on Supreme Air, LLC to send the right people for the job! We value responsiveness because we know that especially in plumbing emergencies, customers often can’t wait until the next day for service. We want to keep you safe and satisfied, which is why we go above and beyond to be available whenever you need us for whatever services you require in an emergency. If you work with Supreme Air, LLC, you will never have to worry about being left out alone when you are in need of immediate assistance. The search for the perfect HVAC partner is over! 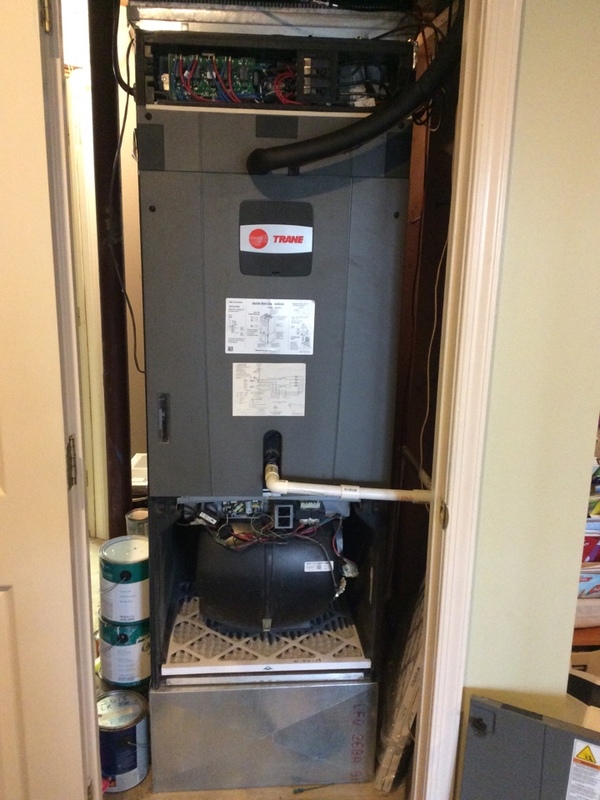 Supreme Air, LLC is the only answer when it comes for reliable and experienced professionals providing heating, cooling, geothermal, and plumbing services, repair, installation, maintenance, and tune-up in Bel Air, MD. Get started with a provider you can trust by calling (410) 788-1144 to talk to a member of our team about how we can help you today! !